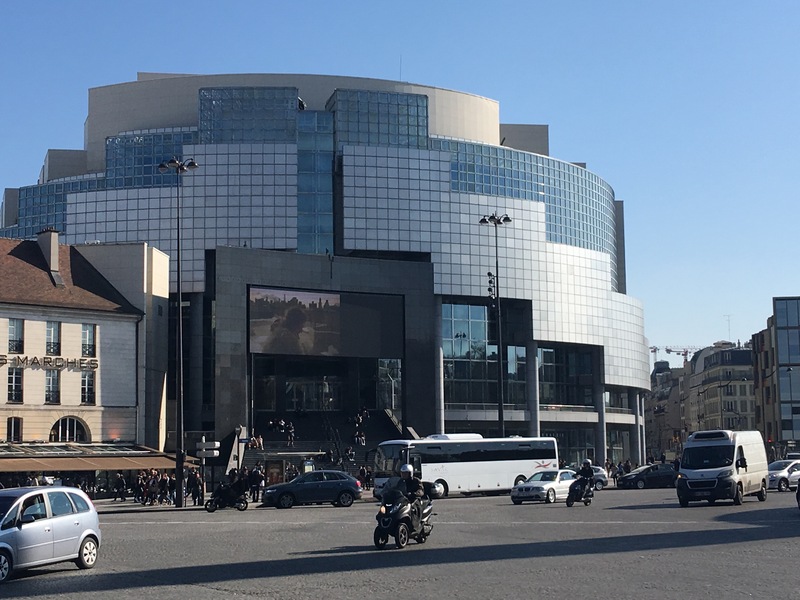 The best part about an extended stay in Paris is having the time to wander about with no agenda. It is great to look at the calendar a see days with nothing in them. 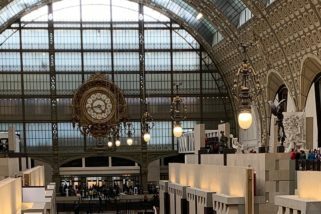 No Musee d’Orsay in the morning with lunch on the rue Montorgueil and then Musee Pompideaux in the afternoon. 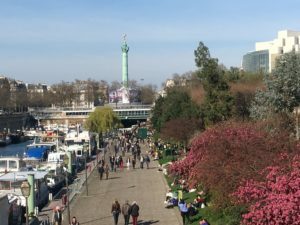 The weather has been unusually warm and sunny for late March in Paris and yesterday was no exception. 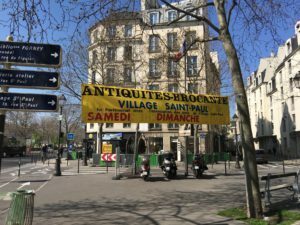 I walked up rue Mazarine the two blocks to Boulevard Saint Germain with no plan in mind. That intersection is a busy one with the Buci Market with its many shops and restaurants nearby. The Odeon Metro (subway) stop along with several bus stops are all close together there. 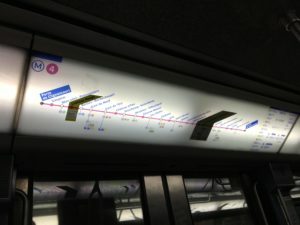 The fastest way to get around Paris is definitely the Metro. 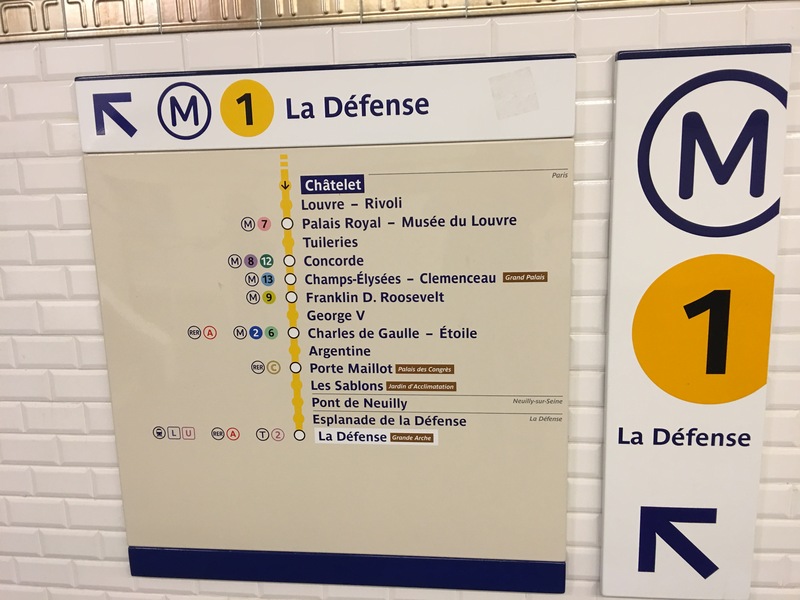 There are 13 lines that crisscross the city and the maps are easy to read. 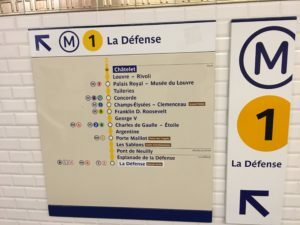 If I wanted to go from the Odeon Metro in Saint Germain to the Arc d’Triomphe I can take the 4 line toward Clignancourt and get off at Chatelet and follow the signs to the 1 line toward La Defense and get off at Charles de Gaulle Etoile and climb a bunch of stairs and step out into the sunshine “et viola”, the Arc d’Triomphe all in about 10-15 minutes. The downside is there are a lot of stairs, no scenery and they are safe, but you have to keep an eye out for pickpockets. The buses take longer, but the scenery is much better and there are no stairs. As I result I have been trying to learn more about the bus routes. 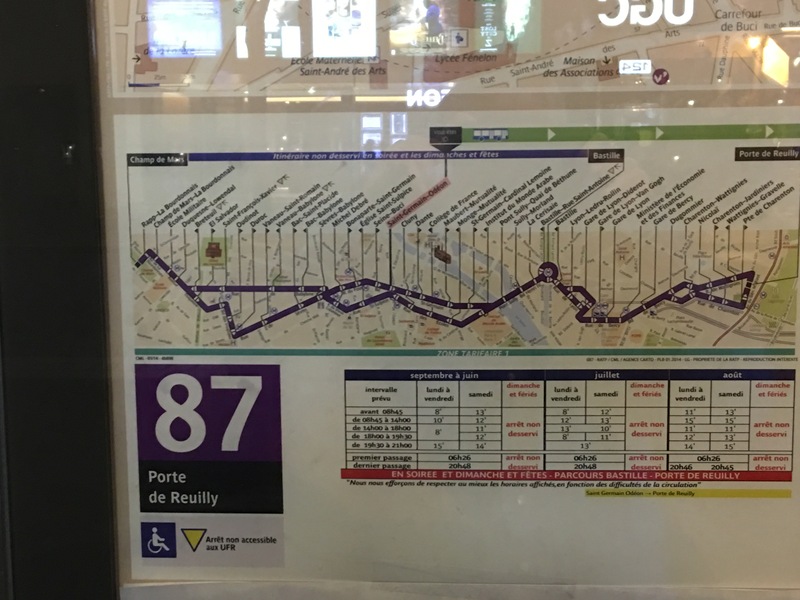 The maps are not as easy to read. 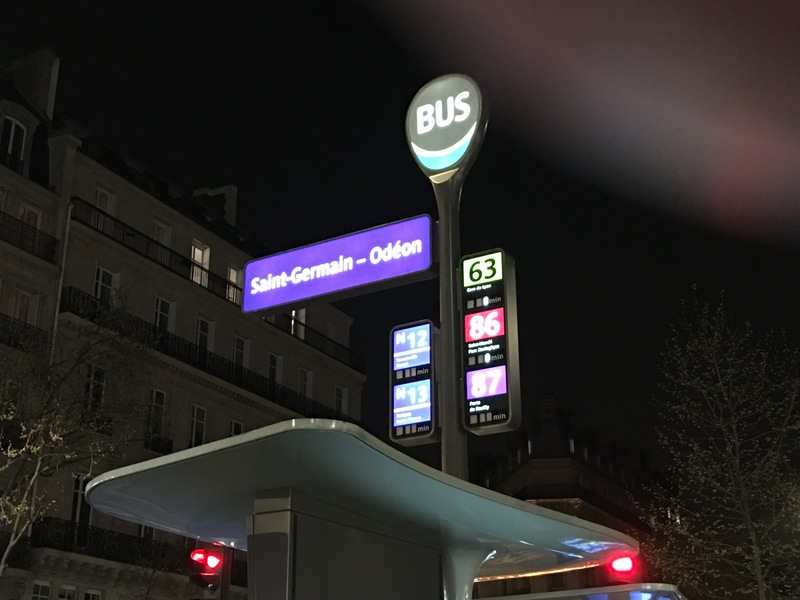 Just as I reached Boulevard St Germain the 87 bus was rolling up and I pulled out my Navigo pass and hopped on. I looked up at the map above the windows to see where we were headed. 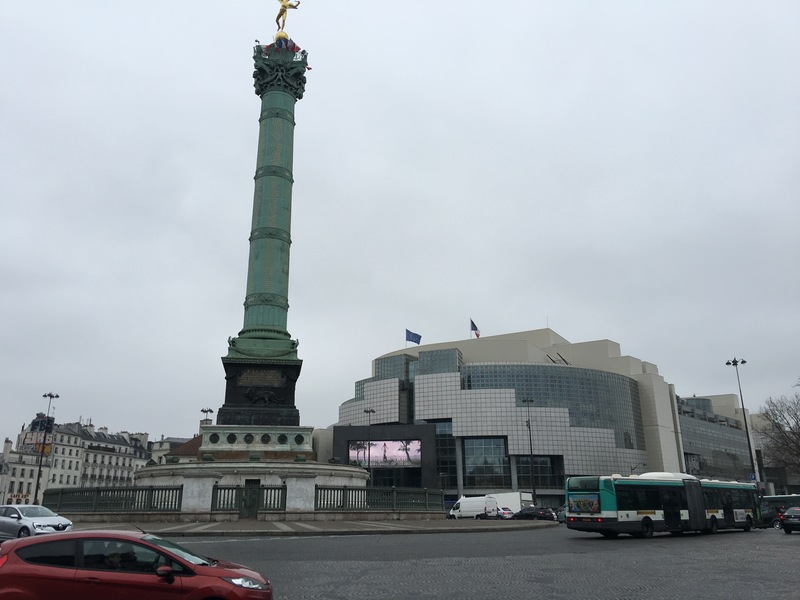 I noted that the Bastille was on our route and I thought that would be a great starting point for a walkabout. 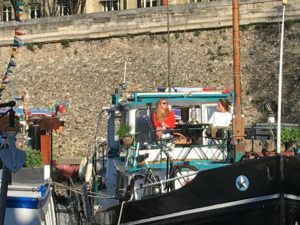 Most have heard about Bastille Day in France. That term is actually only used in English speaking countries. In France they celebrate July 14, 1789 when the Bastille was stormed by the people to get the gunpowder the monarchy was storing there. It is simply known as July 14th or “fête nationale française” (National Celebration). It marks the day of the real beginning of the French Revolution in which Louis XVI, the last of the Bourbon Kings, was overthrown and guillotined along with his wife Marie Antoinette. A republic was set up based on the ideas of ‘Liberté, égalité, fraternité’. The reason for the revolt was that there were three “estates” in France that were “represented”. 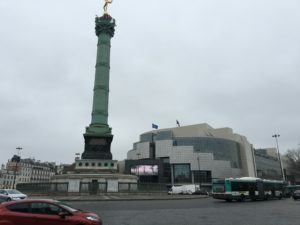 The first estate was the church, the second was the nobility and the third was the people and guess which one did not have a voice in government and yet was paying all of the taxes and guess which was the one that stormed the Bastille…sound a bit familiar? 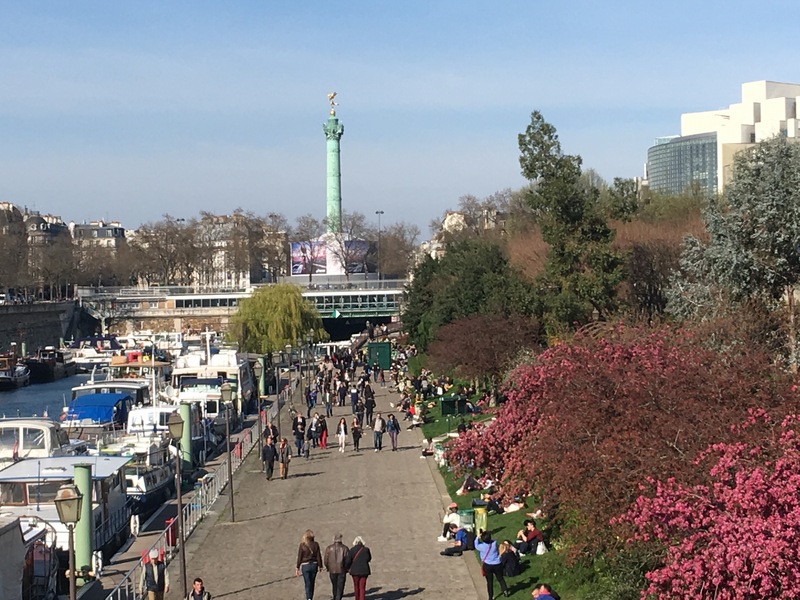 Today the Bastille is a big traffic circle marked with a monument in the middle, many restaurants, an outdoor market and the new Paris Opera built in 1989. After wandering about the Bastille for a bit I started my walk heading south toward the Seine along the Canal Saint-Martin. 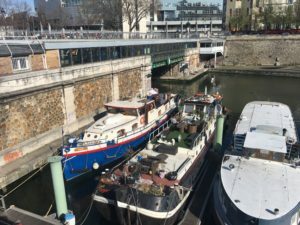 There is a beautiful marina in the canal separated from the Seine by a lock. I had a great conversation with a man from Boston siting on his boat. 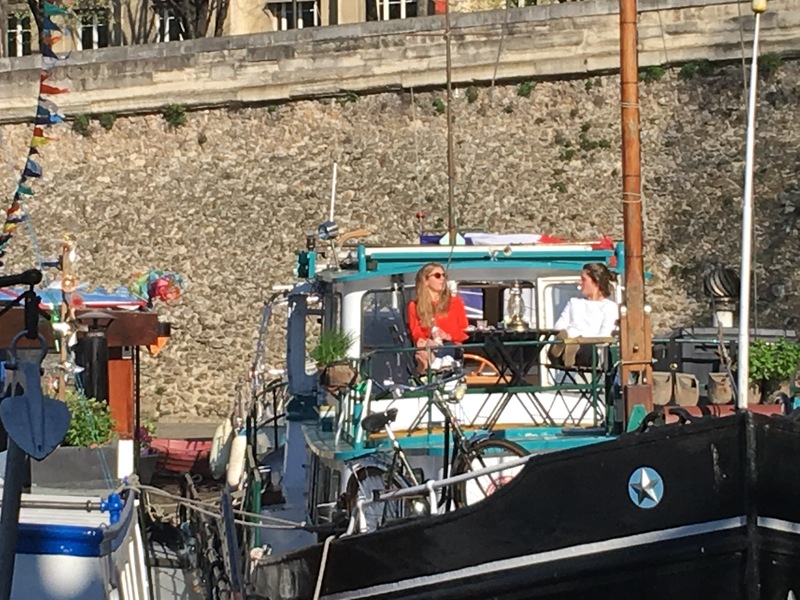 He told me his wife works in the fashion industry and they live in Paris on the boat. I asked about where he could go in his boat and his eyes lit up. 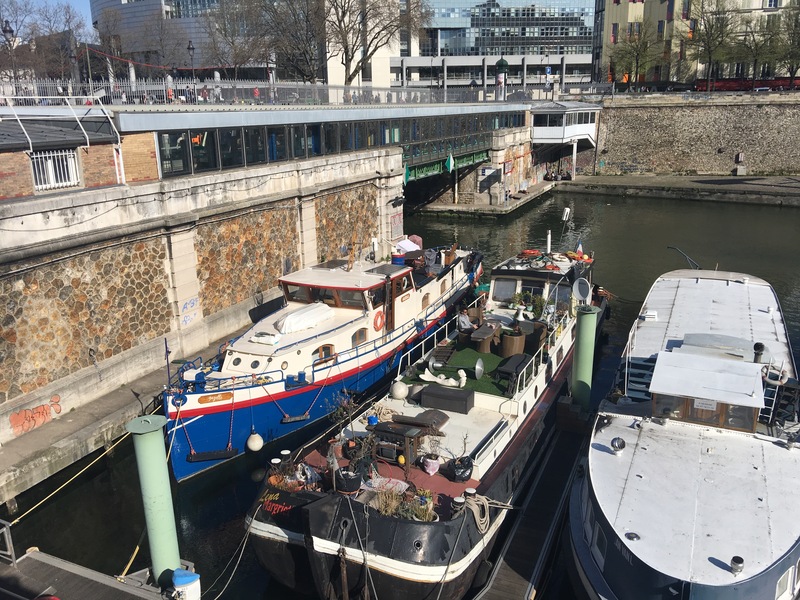 He explained that he could access over 2500 miles of waterways in France along with many in the Netherlands and Germany including the Rhine and the Danube which opens up many other parts of Europe. 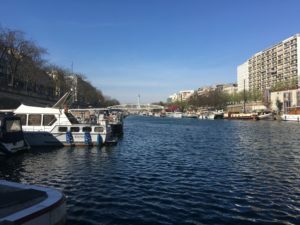 He could also go down the Seine to Le Havre and the ocean and cruise down to the Mediterranean. It was not surprising that he seemed very happy with his life. 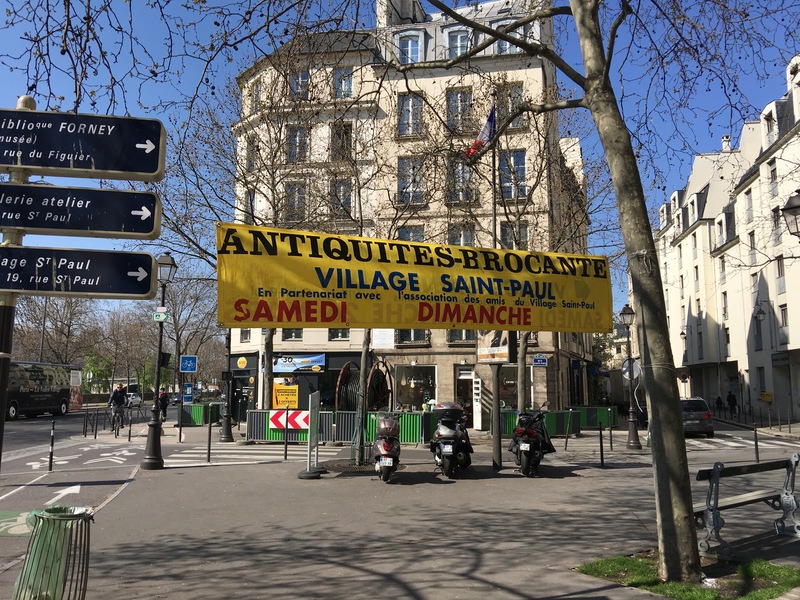 After walking down the canal to the Seine I took a right and headed along the river and just before I reached the bridge to the Ilse Saint-Louis saw the sign for the rue Saint-Paul flea market and I took a right and started walking north away from the river. 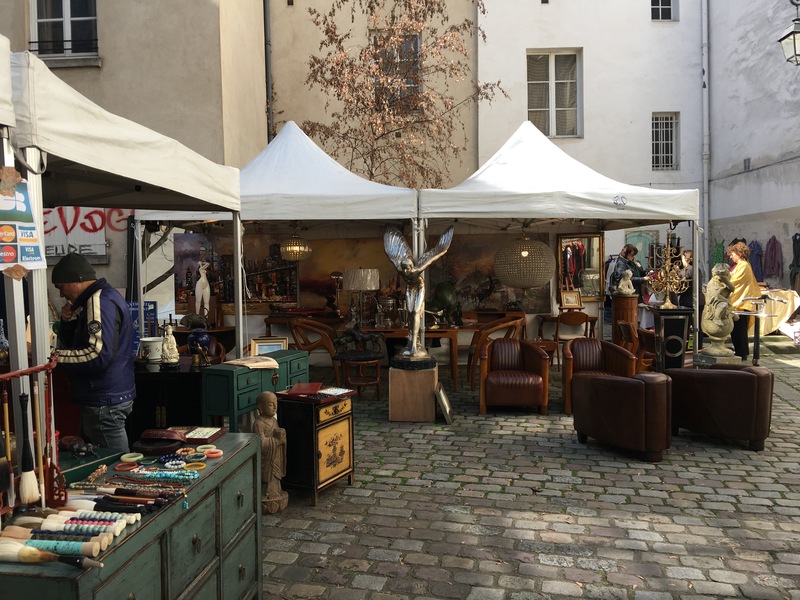 I had been to this flea market in prior years and I knew it would be a worthwhile diversion. As I was leaving the market I remembered something else that was on rue Saint Paul. When you are in Paris for 5 weeks you cannot eat out all the time. It would be hectic and expensive and that is why it is so nice to have an apartment with a kitchen. 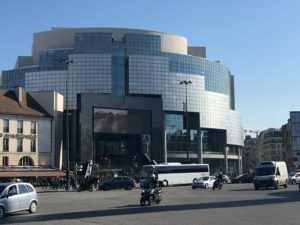 I can go to the local market and stock up pretty easily, but there is one thing that even the biggest markets, including the “Bon Marche”, will not have. 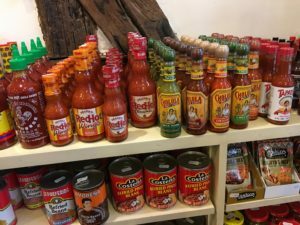 My friends in Santa Fe in particular will understand that hot sauce is simply a necessity in the kitchen. 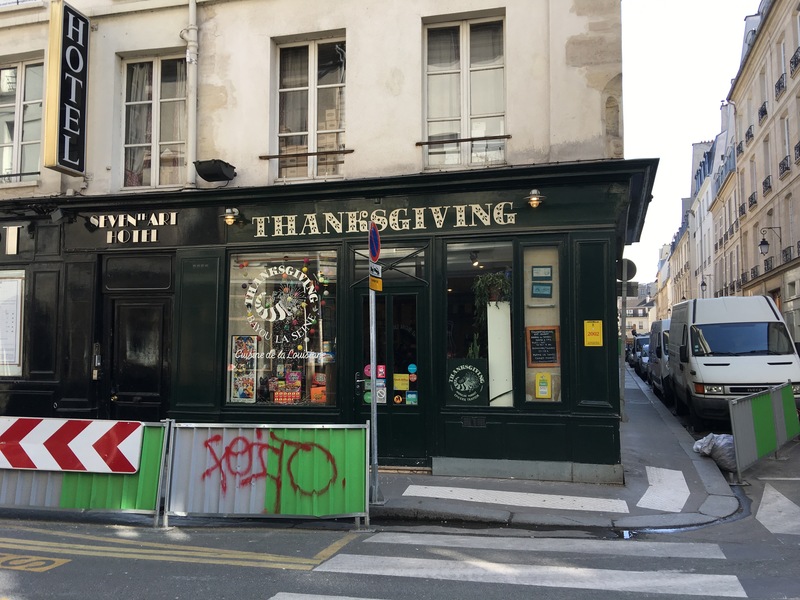 There is only one place in Paris that I have been able to find this indispensable condiment and that is in a store at 20, rue Saint-Paul called “Thanksgiving”. You can also find all things from the U.S. there like M&Ms, Cheerios and Pringles. Well it was an interesting day and it was time to head back and pick up a roasted chicken from the Charcuterie in the Buci Market and take it home and smother it in hot sauce…Bonsoir mes amis! 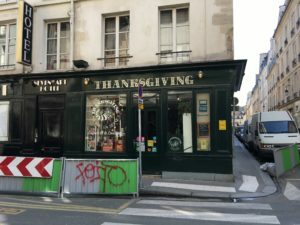 MA, Thanks, I found it at 194 Rue de Grenelle and I will check it out the next time I am in the neighborhood.